Novagard offers a complete line of silicone sealants manufactured to meet all of your manufacturing requirements. NovaFlex Glazing & Building Silicone Sealants meet or surpass all industry standards for window and door fabrication applications and all types of retrofit, new construction and remedial window installation applications. Novagard silicone RTVs are single-component, high-solids, low-odor materials which cure to low modulus, flexible and durable rubber-like solids upon exposure to atmospheric moisture. The NovaFlex Ultra-Low Migration Glazing Sealant is designed to have ultra-low plasticizer migration, protecting other window components from attack and degration. The NoveFlex Ultra-Low Migration High Impact Sealant is Miami-Dade County Code-approved. Choose NovaFlex products for all conventional glazing and sealing applications that require fast set-up and superb primerless adhesion. Novagard provides the right fenestration product for a multitude of applications including: primary bedding sealants, mullion joinery, mitre and seam sealing, PVC sash lineal reinforcement, heal, cap and toe beads, etc. 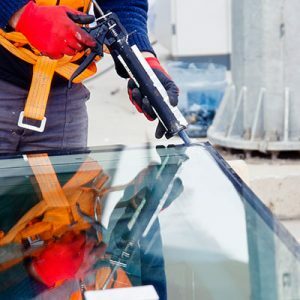 The products of the NovaFlex Series are non-corrosive, single-component, modified oxime cured silicone sealants and adhesives which are used most frequently within the window and door manufacturing industry as glazings and structural back-beddings. The NovaFlex products are available in a broad range of standard and custom color formulations. NovaFlex products will develop primerless adhesion to most common construction substrates and the neutral cure is compatible with most materials. A patented Novagard innovation, NovaFlex SB was manufactured to compliment any type of glazing rabbet profile design. Novagard combines modified oxime cure technology with consistently sized spacer-beads to provide a “liquid shim” primary bedding seal on wood, PVC, fiberglass and aluminum. The bead assures controlled compound thickness between the glass and the sash, which will maximize sash performance while minimizing sealant consumption. It also eliminates squeezeout, which provides for easier re-glazing. Tailor your SB product with a specific spacer-bead size and your choice of cure rate, viscosity, green strength, physical properties and color. A one-part neutral cure silicone sealant formulated for impact protection and blast resistance. Primerless adhesion to most framing materials with tensile strengths of 370 psi. Level F Impact Zone ASTM Approved for Dade and Broward Counties up to DP 100. A cost-effective alternative to competitive two-part sealants, structural tapes and windshield urethanes. NovaFlex Ultra-Low Migration Glazing Sealant is a non-corrosive, single-component, oxime silicone sealant and/or adhesive. It is designed to have ultra-low plasticizer migration, protecting other window components from attack and degradation. This product can be used for all glazing applications to ensure a long-lasting seal. A non-flowable, paste product, it presents an excellent balance between rate of cure and physical properties. It emits a lower odor than conventional acetoxy cured silicones. NovaFlex Ultra-Low Migration Glazing Sealant is a VOC compliant product and is ideal for everyday glazing. NovaFlex Ultra-Low Migration High Impact Sealant is a non-corrosive, single-component, oxime silicone sealant and/or adhesive. A nonflowable, paste product, it presents an excellent balance between rate of cure, adhesion, and physical properties. It is designed to have ultra-low plasticizer migration into the IG secondary seal. This protects other window components from attack and degradation. This conforms to the new recommendation of IG manufacturers on all Impact Window fabrication to ensure a long-lasting seal. This product has been approved as part of the system to obtain Miami-Dade and HVHZ approval for glazing applications.